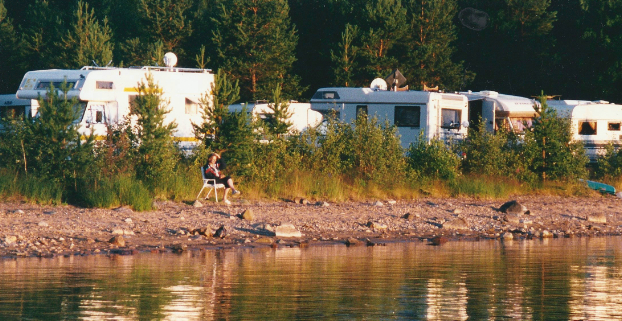 Storsands Camping is situated in a beautiful nature-area by Holmsjö lake's beach, just beyond the major tourist area. The sunset behind the lake has to be seen. The camping area itself is so large that no one is the least bit crowded. This is the perfect place for relaxation and bathing. The sandy beach is long, with clean water. Should you want to explore the 150 kilometre Holmsjön, there are pedal boats, canoes and rowing boats with motors for hire and the lake is full of fish. You won't have a chance to be bored. You can play mini-golf, beach volleyball, billiards, boules or rent a mountain bike. In the communal room, you can watch TV, play board games or borrow a book. For the children, there's a play area and mini-farm. Storsand can offer you a comfortable camping experience. You'll find a laundry and kitchen, both fully-equipped. For genuine relaxation, try our café and cafeteria, where we serve a great variety of home-baked bread and cakes. There's a small shop with everything from fresh produce to arts and crafts and freshly baked bread every morning. Welcome to our little oasis away from the hectic holiday stress!